From the 4th to the 8th of June the director of the InES, Professor Dr. Armin Heinzl paticipated on the delegation visit on the topic Industry 4.0, digitization, ICT, IT security and IT start-ups by Ms. Minister. Hoffmeister-Kraut. Dabei wurden Estland, Lettland, Litauen in ihrer Rolle als digitale Vorreiter der EU im Rahmen eines fünftägigen Fachprogramms besucht. Neben dem Kennenlernen innovativer Firmen und Start-Ups stand der fachliche Austausch mit Verbänden, Regierungseinrichtungen und Innovationsagenturen zu den Themen Digitale Trandformation, Digitale Infrastrukturen und Industrie 4.0 im Vordergrund. Zudem gab es aufschlussreiche Vorortbesuche bei etablierten deutschen Unternehmen, die auf dem Baltikum Tochtergesellschaften, Poduktionsstätten und Shared Services Center eingerichtet haben. They visited Estonia, Latvia, Lithuania in their role as digital pioneers of the EU within the framework of a five-day technical program. In addition to getting to know innovative companies and start-ups, the technical exchange with associations, government institutions and innovation agencies on the topics Digital Trandformation, Digital Infrastructures and Industry 4.0 was in the foreground. 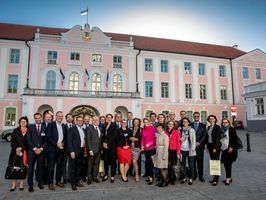 In addition, there were revealing on-site visits to established German companies that have set up subsidiaries, production sites and shared services centers in the Baltics.